Cantor’s Driving School offers driving lessons and driver training in all areas of Glendale, Arizona. Over 50,000 drivers have learned to drive with Cantor’s Driving School. Are you our next safe driver in Glendale? 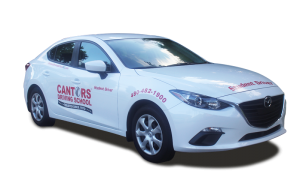 Cantor’s – The Driving School That Gets Results® in Glendale. When taking driving lessons in Glendale, Cantor’s Driving School provides driver training on main roads such as Interstate 17, Interstate 10, US 60 / Phoenix – Wickenburg Hwy, and AZ 101 / Loop 101. Driving lessons can be conducted on local roads in Glendale like Glendale Ave, Northern Ave, Bethany Home Rd, Camelback Rd, Olive Ave, and Northern Ave. The Glendale areas covered include Glen Acres, Bethany Square, Belaire, Cobblefield, Exccutive Palms, Northern Village, Rovey Farm Estates, and Winton Southwest. Teen drivers can be picked up at any of the public or private schools in the Glendale area, including Glendale High School, Mountain Ridge High School, Sandra Day O’Connor High School, Ironwood High School, Independence High School, Deer Valley High School, Apollo High School, and Cactus High School. Zip codes covered include: 85301, 85302, 85303, 85304, 85305, 85306, 85307, 85308, 85309, 85310, 85311, 85312, 85318. Cantor’s Driving School serves the Glendale Arizona area. To get started with driving lessons, call us at 480-482-1900 or use our convenient contact form.